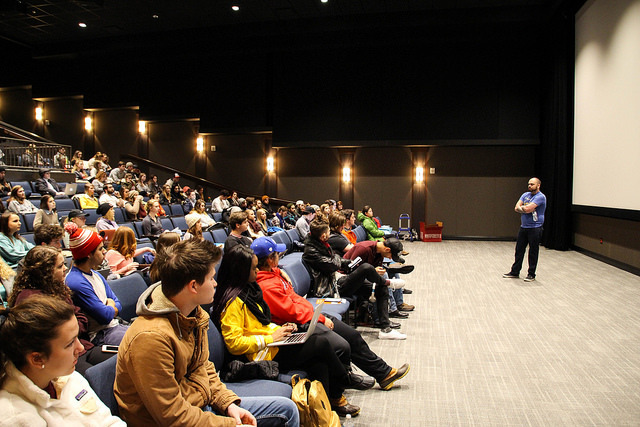 Director of Event Engagements for AC Entertainment James Shinault spent time with Belmont students on Wednesday, Jan. 20. Shinault shared how his high school dream of being a rock star led to producing some of the biggest shows and festivals. As part of Belmont’s “A Day in the Life” Program, Shinault advised students on to go from being a college student, to an intern, to a successful player in the music industry. He began talking about how his music business degree landed him an internship with South by Southwest (SXSW) where he worked until 2012 when AC Entertainment recruited him to revamp the volunteer program at Bonnaroo. Shinault now assists with presenting more than 850 shows a year in addition to various festivals such as Bonnaroo, Forecastle, WayHome, Big Ears and more. When asked about his favorite part of his job he said, “Creating unforgettable and unique moments that people will always remember.” Shinault discussed AC Entertainment’s emphasis on fan engagement and how the company strives to create the most enjoyable and interactive experience for the fans. Shinault ended his discussion by sharing information about AC Entertainment’s externships, which are exclusively offered to students at schools where Shinault has spoken. There is also a volunteer program at Bonnaroo, as well as internship opportunities at the company’s Knoxville and Nashville offices.